Life on the sea has been replaced by life on the hard. The sounds of waves lapping the hull are replaced by paint scrapers tapping the hull as workers arrive at the gel coat. Wind howling in the rigging becomes the corrugated metal garage door opening for business at 7:00. Crying gulls have become cooing doves. Our one step up from the dinghy is now a 12 foot climb up the ladder. The daily din of sanders, grinders, buffers, and compressors, mixed with the distant traffic and train whistles replace the deep calm of isolated anchorages. We now drive in our car to the ocean, smell the once so familiar salty sea and feel the saline smoothness on our skin. 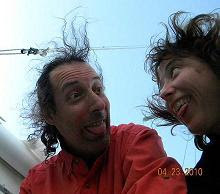 We jump into waves, let them push and roll us in awe of her power, remembering when we rode the ocean in our giant saddle on the sea, the sailboat Traveler. Here she sits on stilts with me in her belly, waiting patiently while we do things to her. 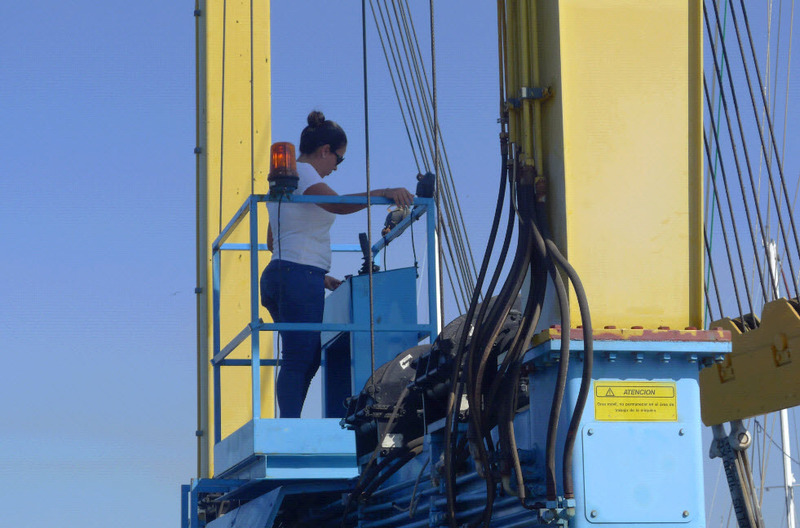 Yesterday we pulled out her engine with a crane, like a bad tooth. Can it be saved? Hoses removed like clogged arteries, we are her surgeons tracing the wires of her nervous system making detailed maps to assure everything goes back in its proper place. It’s only a matter of time, though, before she is released into the wild where her wings will fill with the wind that makes all our hearts soar. Traveler and her travelers will prevail! 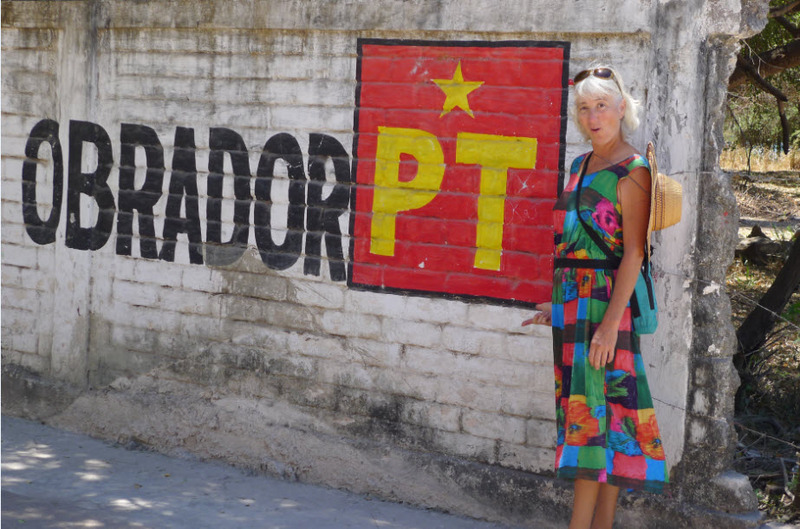 Life on the hard…. 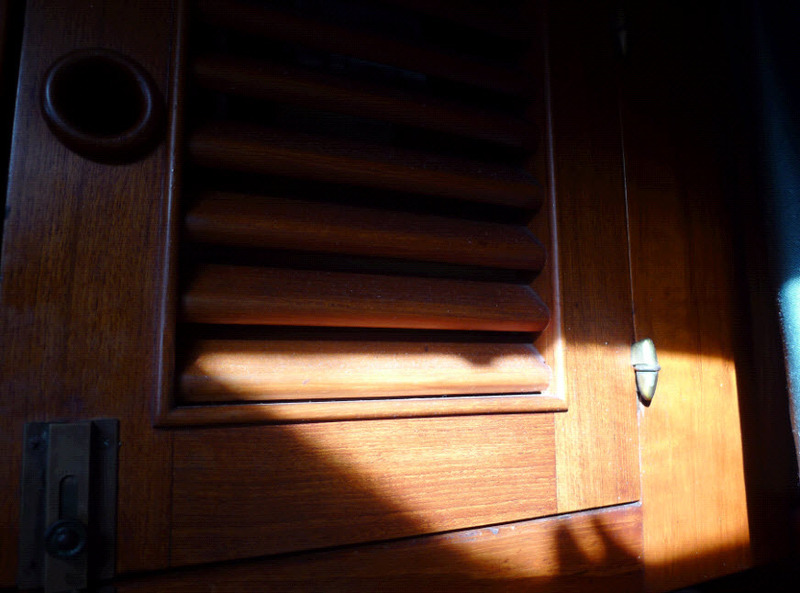 As I lay in bed the sunlight shines through the starboard port hole and paints a bright orange oval on the varnished teak of the cabin wall. The oval is still. It does not dance like it does at sea. We must be at the dock. When at anchor or while underway the morning light comes in much the same way but the orange oval dances up and down and around with the movement of the boat. If the boat is rotating about her anchor like she often does in the morning as the land breeze gives way to the sea breeze the orange oval might just dance halfway around the cabin until Traveler is pointed out to sea. At times there will be a second, less intense, oval just below the first. This is the reflection of the morning sun hitting the water and bouncing back up to the port hole and into the cabin. These two ovals will start to separate as the sun rises off the land until the weaker one, the one that really shimmers, disappears entirely. I have plenty of time to see these kinds of things. It has taken me some time to get to the point where I can watch the world around me for these small details. Let’s consider (Why not? 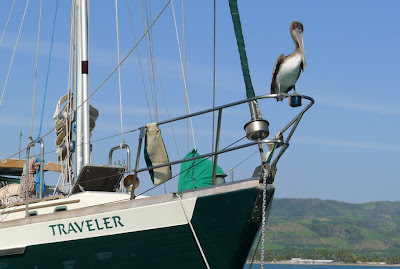 We've got plenty of time) the differences of Traveler at sea versus Traveler at the dock. At sea the morning oval on the wall dances. At the dock, the oval steadily advances, as true as a sun dial. Our habits change when we are away from the dock. At sea we are miserly with our water and power and each morning and evening I check the amp meter. At the dock, we run the water faucet at will and plug everything we can find into the wall outlets, using the microwave or toaster oven on a whim. At first I’ll check the amp meter each morning until it finally sinks into my head that it will always read 13.3 while we are plugged into shore power. At sea I cram myself into the head each morning and carefully do my business. At the dock, we enjoy and appreciate all the porcelain facilities on shore, even taking hot showers on occasion. Often at sea, we find ourselves being woken by Traveler as she makes her wild gyrations having turned her side to the incoming swell. But at the dock everything is still. At sea the stars are brilliant. At the dock the stars are still there but fainter, and they compete on Friday nights with the local fireworks display. On the weekends we hear the sounds of the tuba and other horns wafting over the water from the resort around the turn. At sea, we hear only the wind in the rigging and the boat banging around. 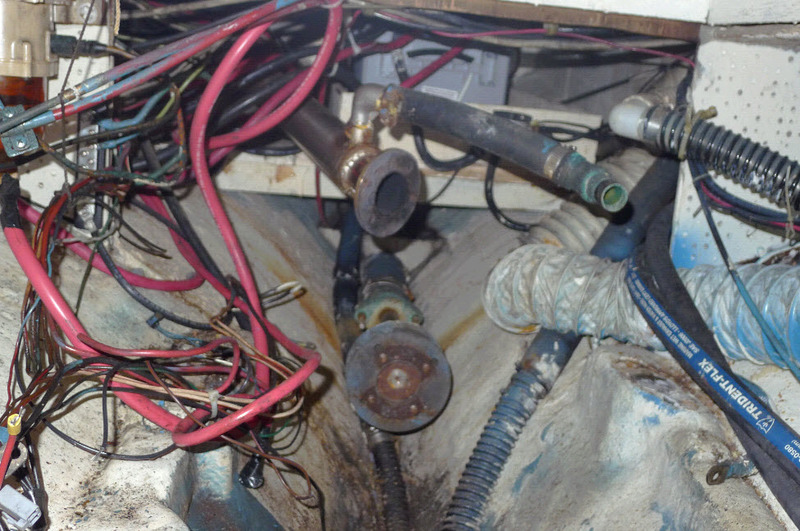 In an active anchorage, meaning one with waves and swell, I spend some late night minutes searching around the boat with a small flashlight trying to snuff out a clinking, clattering item bashing around inside some cabinet. At the dock all is still and you can leave the wine bottle sitting out on the counter and the ink pen on the table. But… you will hear the occasional burp of the bilge pump or the quiet click and hum of the refrigerator. So we have two different worlds we live in, one at sea and one at the dock. I prefer, of course, the one at sea but after being at sea for a while those first few days at the dock seem to bring such luxury. We’ve been here at the dock for about 12 days and the place is becoming quite familiar. Each morning, across the channel the big yellow diesel crane truck comes out of its lair under the bridge and rumbles across the sandy flats to the dredge site where it sits all day, unused, until late afternoon when it rumbles its way back across the flats homeward. 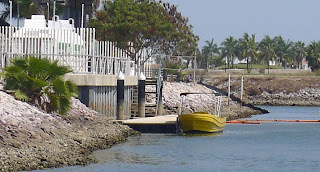 Likewise, each morning one of the marina workers walks down to the dock and drives the big yellow panga around to the fuel dock where it stays all day. Later that afternoon, the fuel dock closes and the same man drives the panga back here to the dock and ties it up using the same line on the same cleat just as he did the day before. 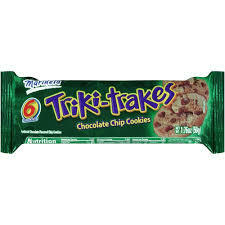 As I see the panga go by I look across the flats to the highway were the two rolling billboard trucks slowly promenade down the road towards the hotel zone, only to turn around and slowly promenade back advertising the new Triki Trakes cookies with chocolate crème filling. As this is near sundown, there will be one or two fishermen standing in knee deep water tossing their nets into the murky water. Each day the mud flats across the channel march out past the big stick that someone stuck in the muck to warn boaters away. 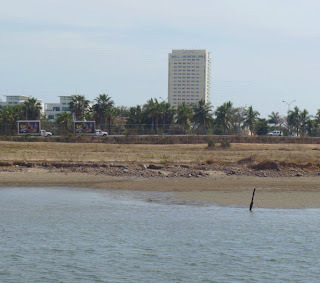 The ridge of mud will extend just a few feet beyond the stick before the tide turns and the water begins to cover the mud flat until five hours later it is all water, water with that big stick poking up. If it is near sundown, a crane (bird, not machine) will stand next to the stick as the water starts to lap up its legs. 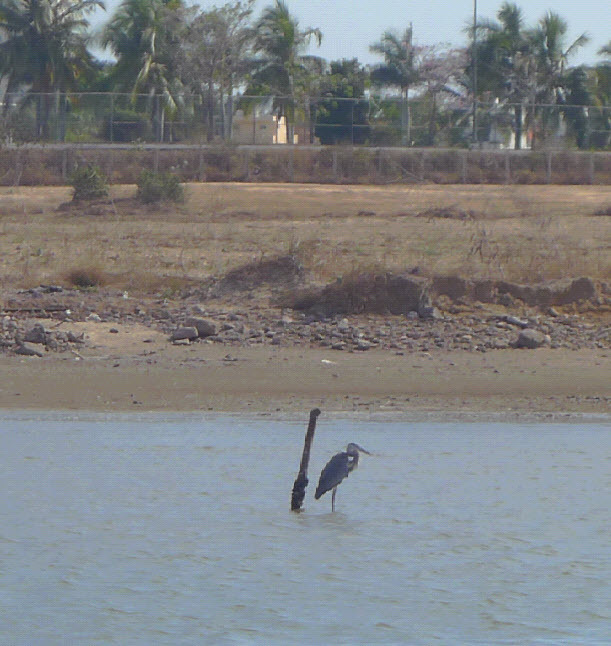 Same crane, same stick. Does observing all this mean we’ve been here to long? Probably, but not necessarily. Connie likes to say that there is a reason for everything. Maybe the reason we are here, waiting two weeks to get hauled out, is for me to take the time to chill a little. So I’m on the watch for other predictable comings and goings and am delighted that at this time, in this present situation, I have the leisure to listen and observe. Note: Traveler is now on the hard. We had our survey today. Tomorrow we get the estimates. Hold on to your hats. This one is gonna be a whopper! 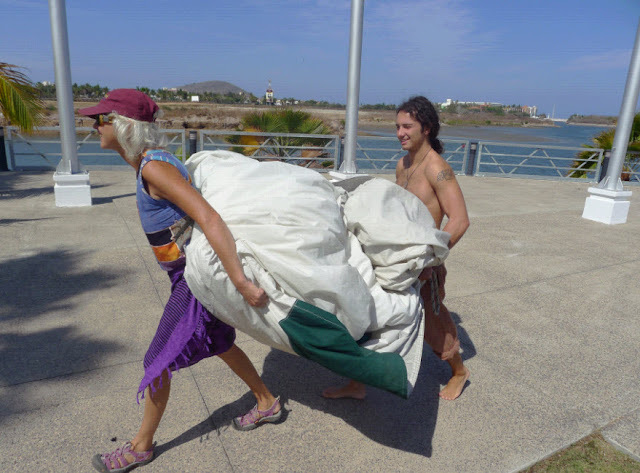 We have certainly enjoyed our travels down the Costalegre with its beautiful beaches and cozy anchorages. 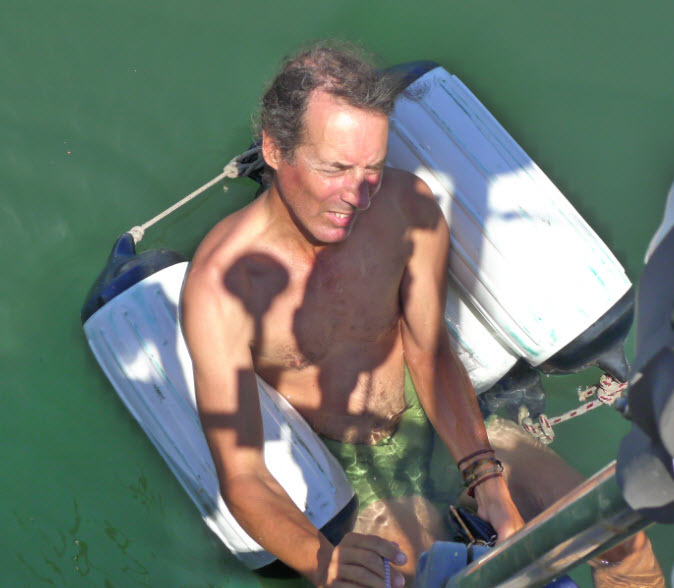 As we made our way from Manzanillo north to Bandaras Bay we discovered a leak in the boat that started out as a faint trickle and by the time we left Yelapa it was a full blown stream causing the bilge pump to cycle every couple of minutes. 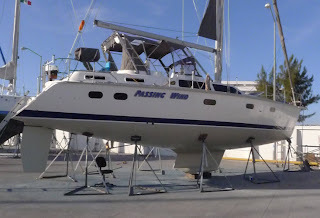 At the marina in Puerto Vallarta we took a good look and found that the scupper drain that exited below the waterline had a crack in it that needed repair. 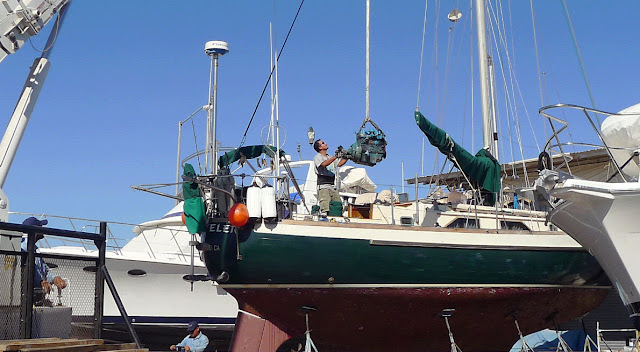 We tipped the boat over a foot or so by taking the jib halyard to the dock and cranking it over. 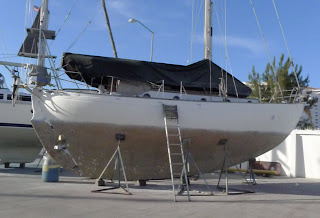 This raised the hole just above the water so I could temporarily patch it with some 3M Fast Cure 5200 Adhesive Sealant, doing a sloppy (but thorough) job of it while I floated on top of some fenders in the fetid waters of the marina. Great! The refrigerator is failing and we have a hole in the hull. We better do some boat maintenance ASAP. 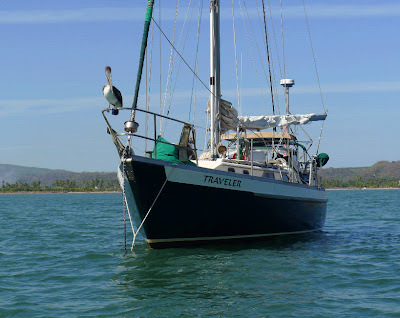 La Cruz was wonderful, for sure, and we enjoyed going out to hear Luna Rumba a few times but we hoisted the anchor, cleaned the barnacles off the flopper stoppers, and headed to Punta Mita for an early morning start up the coast. We got a favorable weather window when the north winds calmed down for a while and then did the jump to Chacala. Ubiquitous hauling bike and Ez in front of a bed of Aloe Vera. 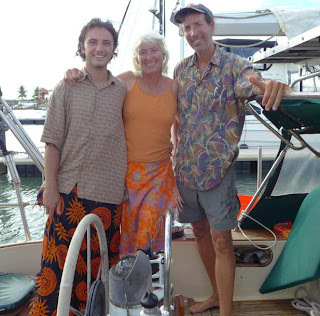 We anchored bow and stern there for the night and continued north to Matanchen Bay where we met up with our friends on Luna Sea. 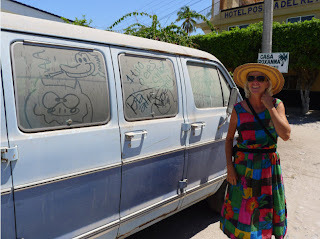 We spent a few days there and enjoyed seeing the town of San Blas and hanging out at the palapa bar on the beach with Hal and Nina but we needed to get north. We had a hole in the hull for Dog's sake! 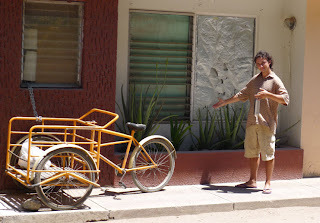 While walking through San Blas we found Paul Hjelm's old van that Ocho Pies used to carry their equipment to gigs. Connie was overwhelmed at the sight of the old beast! She misses playing music with the band. Now she gets her music fix by singing and playing the accordion or ukelele when she's not busy sailing the boat. Connie played in a band named Obrador. It was good to have Ezrah along as a third crew member as we did the 36 hour non-stop to Mazatlan. We took three hour shifts through the night. I especially liked the midnight to three AM shift under a moonless sky with Pink Floyd in my ears. 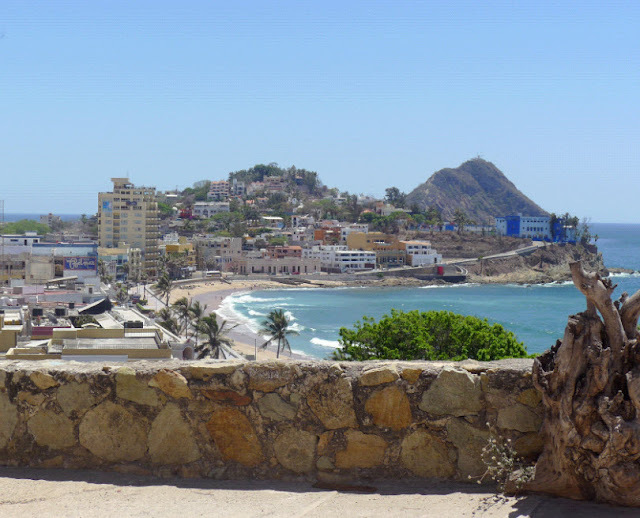 We arrived in Mazatlan in the afternoon and surfed through the harbor entrance on the huge swell that had been closing the bar to traffic the day before. 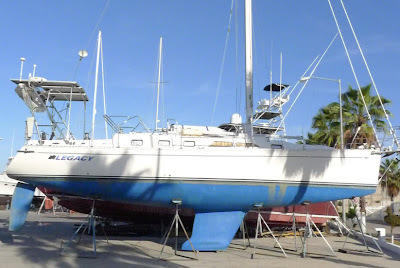 Now we are at the Fonatur docks next to the work yard where we will haul out in two weeks to get the thru hulls fixed, the bottom painted, the hull sides painted, and various drive train items repaired. We'll also drop in a new refrigeration unit and do some deferred maintenance here. I love this marina because every day they are hauling out another sailboat into the yard. So I get to see all sorts of hull shapes and sizes. 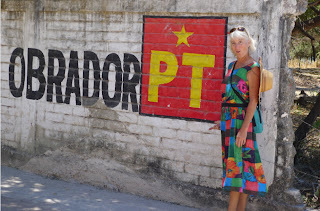 And that is the belated topic of this blog. Velocity of the hull = 1.34 times the square root of the length of the waterline. 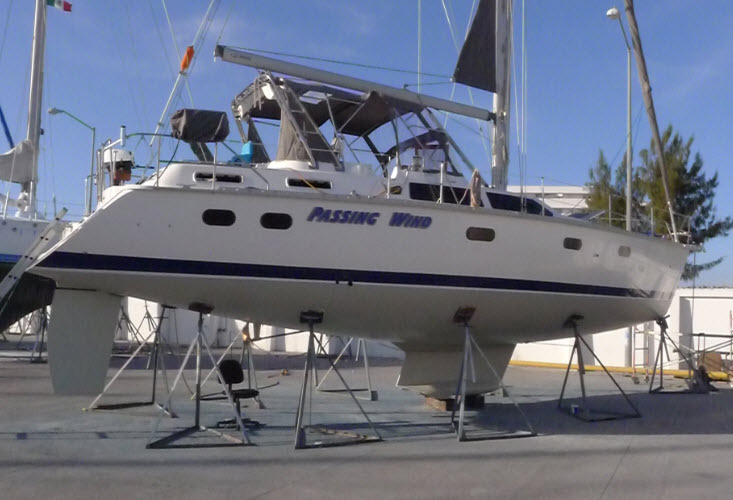 At 34 feet 10 inches at the waterline, Traveler's hull speed is 7.91 knots. That's as fast as she can go. Can her engine push her that fast? Probably not. Can the sails? Oh yes. 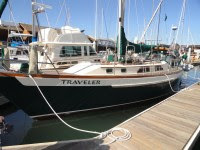 Traveler has lots of hull under the water, which means lots of wetted surface and friction. The keel, while not running the entire length of the boat, is a pretty good sized monster. With this big keel, she likes to go in a straight line. With her general hull shape she is pretty sea kindly, meaning that in a rough sea she is fairly stable. In a rough sea she won't "seem" stable but believe me, she is more stable than many faster boats that have little fin keels and not much else below the waterline. Note that she has a skeg-hung rudder. The skeg protects the rudder somewhat. 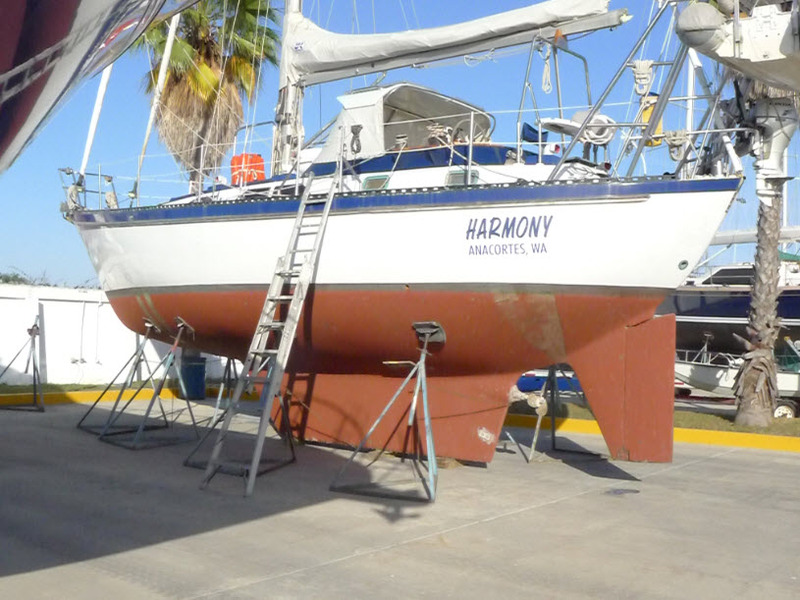 The keel extends about 8 feet fore and aft making her track well but not be very good at turning on a dime or backing up. 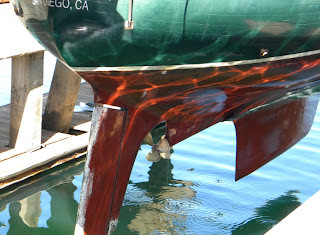 A little short keel part extends aft from the keel and houses the propeller shaft and helps protect the prop. The stern is rounded. Some call it a "canoe" stern. It is thought that when a big breaking wave comes at you from the rear the rounded stern will rise through it easier than a big vertical flat stern. The downsideis that we've lost some nice storage space in the rear and some flotation. I'd say that the design of Travelers bottom is a nice compromise between the full keel behemoth found on old boats to the fin performance keel found on new, fast models. So let's pull a few boats out of the water and have a look at their hulls. This is the machine they use to pull the boats out of the water. It reminds me of a machine found in a Doctor Seuss book, not this machine. I could not find the one I was looking for which featured the grinch or somebody riding high on top of a strange contraption. Once they get them out they balance them on the keel and add supports to keep it all upright. Looks precarious doesn't it? 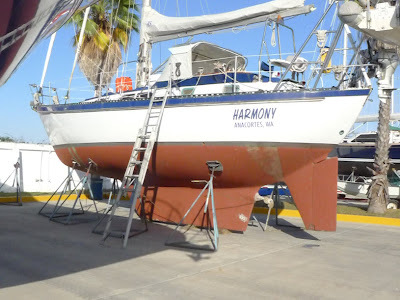 Harmony has a similar hull shape as Traveler. Here are a couple of Westsail 32's. 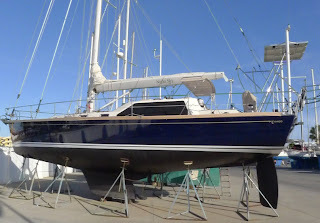 Note that the keel goes all the way from the front to the back. Some mean people call this the "WestSnail 32" but not me. I think they are beautiful. 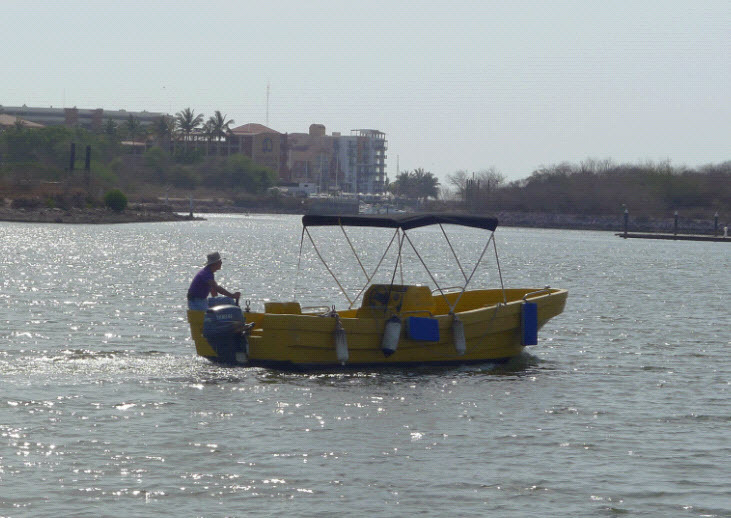 These small boats have traveled the world in safety. And if you want to get totally historic, there is this little gem of a hull shape. On the other extreme, we have the fast boats. Fin keel, spade rudder. Turns on a dime but might take a pounding in a big sea. You can see on these performance boats that the bow is pretty vertical and the stern sticks out as far as possible. This extends the water line so that the hull speed (as explained above) is very long in comparison to the overall length of the boat. Legacy's LWL(length of waterline) is 39 with a LOD (length on deck) of 43. By comparison, Traveler's LWL is 34' 10" and her LOD is 41' 9". 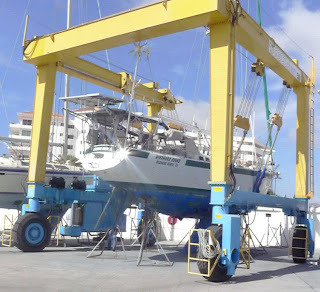 So as you see, there are many types of boat hulls out there, some short and deep, some long and thin, some with wide sterns some with rounded butts. It is a trade off any way you go. We think we've got a nice compromise, but still... it would be nice not to be passed by every time we have a boat come from behind us while we are in transit. This is a common occurrence. "Here she comes, there she is, there she goes." We will be here in Mazatlan for about a month. Feel free to come visit us and bring lots of money to pay our yard bills. 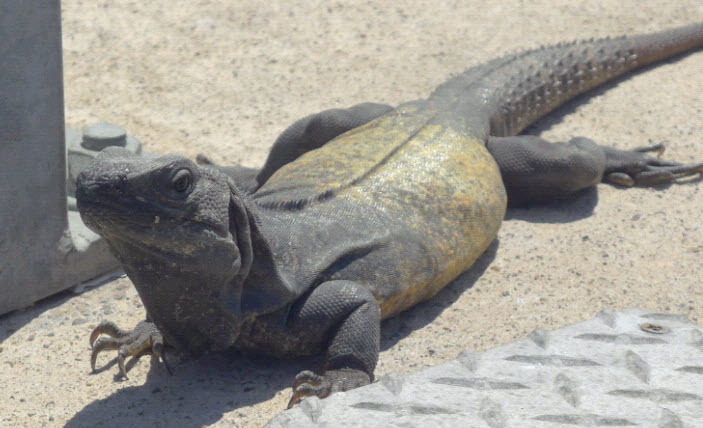 We hope to escape north to the Sea of Cortez when this work is done.